I haven’t read anything but comics in about a week, because I’m behind on this book review. The irony is, of course: in what world am I worried about the quality of a Deathlands review that nobody cares about? Emerald Fire was a mixed bag. I liked the setting (somewhere in Central America, for a change of pace) and the idea of helping local tribes against slavers trying to keep a silver mine running. I probably should mind the “American saviors of helpless natives” trope, up to and including the part where the albino kid was worshipped as their god. But that was overshadowed by the part where our heroes were nobly disgusted by all the ritual human sacrifice. It’s like, in-world you’re descendants of the people who blew up the world, and your home stomping grounds treat life as cheaply as the rotgut that passes for liquor; and from the reader’s perspective, you’re a subgenre mashup of two barely respected literary forms. In each of these cases, you’re not good enough to cast aspersions at other cultures. Of course, the problem here is, now I’m forced into the role of apologist for cultural relativism and human sacrifice, and that’s not very exciting for me. But man were they being holier-than-thou about it. Oh, hey. One other random thing, regarding the cover. I wonder if they had this in mind for an earlier book, but it wasn’t ready in time or something like that? Because two books ago, there was definitely a fight with a giant mutant crab. There equally definitely was nothing crablike in this book. So! This entry was posted in Words and tagged Deathlands, men's adventure, science fiction on December 9, 2018 by Chris. 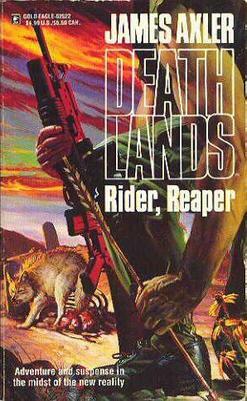 Sometimes the title of a Deathlands book will make me scratch my head in puzzlement, since it seems like they just took a couple of random words, one of them semi-complex, and strung them together, irrespective of the plot of the book. Other times, such as Ground Zero, I’m pretty well on board. See, our heroes have landed in what used to be Washington DC but is now simply referred to as the Washington Hole, what with how many missiles were aimed dead center of the seat of American government. So there’s a blasted pit several miles wide, a new volcano, Lake Potomac, and villes all around the pit where people still live and do business, since it was after all a populous area, pre-nuke. Yeah, ground zero works just fine. That said, it’s really just a string of largely disconnected events, though I guess the second half of the book is tied pretty well together. Highlights include the most powerful mutant seer anyone in the series has ever met, a creepy zoo of rare oddities, a pivotal tornado, more signs of the samurai that rumors say have been all over the place lately, and most rare and wondrous of all, a bartender who remembers our heroes fondly from encounters past. 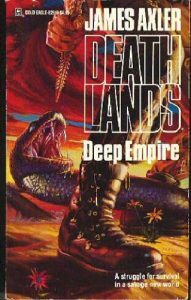 This entry was posted in Words and tagged Deathlands, men's adventure, science fiction on November 13, 2018 by Chris. 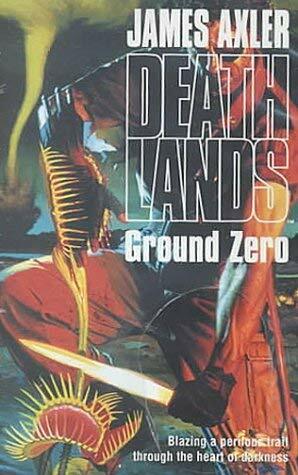 By now you know the Deathlands drill, or have been ignoring reviews of the series and will ignore this one too. The main things that stand out about Shadowfall are the introduction of a new ongoing antagonist (a mutant hypnotist who collects hair, nominally for the sale of wigs) and the inversion of the usual formula, where the ruling baron of the area is typically a power-hungry sadist and tyrant who needs to be toppled. A thing I found interesting is that this was one of the few places where… let me back up. See, Krysty (the redhead who can sense the limited future enough to warn of impending doom, or else have a good idea of whether her friends are safe or not in real time, over long distances) has been wanting Ryan (her boyfriend, the one-eyed leader of the traveling group of… heroes? mercenaries? I guess ronin would be a pretty good analogue) to settle down somewhere pleasant and make babies. The thing I found interesting was that this was one of the few times since she’s wanted this that they voluntarily left a locale where settling down would have been feasible, and she didn’t say a single word about it. The thing you should find interesting about this is that the lack of consistent characterization is a noteworthy outlier. Power vacuums are not really a problem for our heroes, since they will be teleporting somewhere else by the beginning of next book at the latest. Appropriation being what it is, I should first note that this is my assessment, nobody has said anything like that in the books (not that they wouldn’t, because really, this is mid ’90s authorship, but they didn’t), and second note that I really can’t think of an American cognate for ronin. The only thing close is some Westerns tropes, but most of those are lifted wholesale from Japanese samurai / ronin stories and dressed up with six-guns and leathers in the first place, so you see my problem. There have been hints in fact of some probably but not definitely Japanese people popping up in weird places and slaughtering folks, which I expect to pay off in a book or two (and which may be what put the lordless samurai comparison in my head in the first place, come to think of it). None of this would be relevant, except that they’re being referred to as Orientals, which by 1995 really should have been out of common usage. So that’s been an annoyance. This entry was posted in Words and tagged Deathlands, men's adventure, science fiction on October 31, 2018 by Chris. 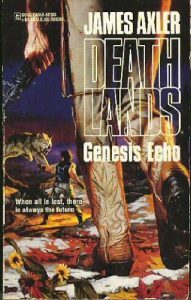 Cool story: Genesis Echo is either the third or fourth in a series of Deathlands cliffhangers, and pleasingly also the last. I mean, of the series of cliffhangers. There might be more cliffhangers later. There’s like a hundred books left in Deathlands the series. Anyway, aside from cliffhanger resolutions, this was mostly a medical horror story. Because, if you take a bunch of scientists from apocalypse era and mostly cut them off from everything for a hundred years (because that’s how they survive the post-apocalypse) but they lose a lot of their knowledge because of a fire, and also the world is terrible, but they’re determined to keep being scientists a hundred years later? Yeah, it’s like that. So, different topic. A thing I like about these books that I probably haven’t mentioned yet is the willingness to do random things that feel more like real life than like a plotted book. In this case (spoilers, but you know you don’t care), last book and into this book, Doc (the guy from the 1890s who was pulled forward in time by scientists in the 1990s, but he was too much of a pain so they sent him forward another hundred years to the beginning of this series to get rid of him) met a nice lady while on walkabout in the mountains of western New Mexico, and brought her home to meet his friends. She was not fond of the idea of going into a teleporter (partly because, reasonably, she didn’t really understand what was going on) and ran away at the last second. Her ultimate fate is unknown, but a chunk of her boot was left behind because it wasn’t clear of the teleport circle when the rest of them went off to the aforementioned medical horror story. So, like, did she live, or is there a border zone where you just get teleported into nothingness? If she did live, is she okay? Is she angry? Will they ever meet her again? I have no idea, and neither, for now, does the author. But someday, I bet I’ll get some kind of answer. Which, I’ve lost track of my point. My point was, it doesn’t matter, it’s just a thing that happened and maybe they’ll never know, because usually you do never know. The only reason I think I’ll get an answer someday is because, like I said, there’s a hundred more books and that’s a long time to go without revisiting a person who left on a giant question mark. This entry was posted in Words and tagged Deathlands, men's adventure, science fiction on September 9, 2018 by Chris. Because Mary is way behind me, it’s too soon to start the next Liveship book. 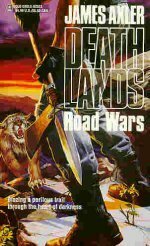 And because Road Wars ended on a cliffhanger of sorts, I figured, hey, why not read the next Deathlands. This has done me no good whatsoever, because Trader Redux ended on a bigger cliffhanger than the last one did, and Mary has caught up maybe a chapter in the meantime. So anyway. This one was better, with timelines significantly more in whack. The old guy from the 1890s who’s been tossed around via time travel went off to find himself, and the main character guy goes whitewater rafting into the barrel end of a shotgun wedding, so there’s plenty enough going on. But the main point of the book, how will our heroes react to regaining their upon a time leader? I would call that aspect of things “incomplete”. Which is part of why this one ended on a bigger cliffhanger than the last one. Even if it is the smallest part. Okay, yes, they all end in cliffhangers technically. But usually the cliffhanger is “where did we teleport to this time, it sure looks dangerous”, and whatever, that’s status quo. Cliffhangers along the lines of “how will the meeting with my old boss who I used to love back when I wasn’t a leader myself, but now not only have I changed, it looks like he has too” and “uh-oh, all my friends have vanished, probably because the house they were hanging out in has more radiation than you can shake a pointed stick at” are qualitatively different. She’s reading plenty of manga in the original Japanese, so it’s not like she’s a slacker. Just not doing me any good. In, uh, this particular regard. I think down the Snake River Canyon, although it’s not entirely clear. It is 100% not the Grand Canyon, despite what the more spoilery than anything I’ve said here (and that’s impressive) cover copy claims. This entry was posted in Words and tagged Deathlands, men's adventure, science fiction on July 13, 2018 by Chris. Vacation nearly always equals Deathlands. And on the bright side, I didn’t run out of book before the plane landed, if only by about 20 minutes of reading. Downside: Road Wars was the worst of these books in a while. It was not exactly bad, yet while it’s weird to say that I have standards for these books, it also turns out to be true. See, this is the culmination of an ongoing plotline from the past multiple books, in which the two main characters have learned that their old mentor from the first book is not dead of radiation cancer like they’d thought, and head out to find him. This results in a series of episodic encounters that may pay off in future books, while their friends who stayed home and their mentor (and the friend who found him) in old Seattle each have their own adventures. The problem being that these stories are split apart for dramatic effect, yet could not possibly have happened across the timetable in which the main characters are travelling from the friends to the mentor, across 1500 miles of nuked wastelands. None of the individual stories were bad, and at least one of them was not merely fine but engrossing. Nonetheless, the skewed timelines bothered me really a lot, and took away from most of what was going on. Still, light entertaining post apocalyptic fluff is not a genre I will soon tire of, and this was only relatively bad. Still far better than, for example, the last Anita Blake I read. 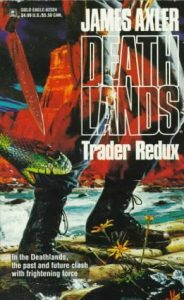 This entry was posted in Words and tagged Deathlands, men's adventure, science fiction on June 30, 2018 by Chris. 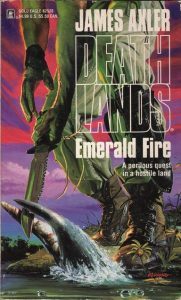 I liked this Deathlands book somewhat less than usual, for a variety of reasons, which I will now elucidate. 2) Due to circumstances, they team up with a group of Navajo warriors to take down the bad guys of the week, and those warriors are portrayed as hot-headed savages worthy of a team-up with 19th century cowboys showing that the white way is manifestly the correct one, instead of 22nd century survivors of a society-ending nuclear war. It was just so bad, and all the moreso for me being used to this series’ shockingly common egalitarianism. Ugh. I am pretty sure the author hasn’t changed yet and won’t for a long time, so I hope it is a one-off problem, and not a sign of things to come due to editorial changes or some other permanent shift. All that said, the set up of the next few books is pleasing to me, and I continue to look forward to where things are going. Please oh please let this be merely a small bump in the road. This entry was posted in Words and tagged Deathlands, men's adventure, science fiction on February 18, 2018 by Chris. 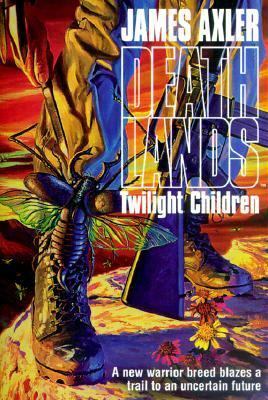 On Sunday, I read Twilight Children, completing my three-book camping weekend bender. In this one, Ryan Cawdor, Krysty Wroth, and their band of (I swear this was written in an amazon description of one of the other books, which I am not making up) warrior-survivalists go from a familiar setting gone direly wrong, to an old West tourist town inhabited by poisonous bird-bug things that I feel probably should have been more consequential than they were, and finally into the meat of the story, in which a paradisaical lakeside community is spoiled by Logan’s Run syndrome. Later, they chill some mutants. So, a thing I realize I’ve left out of these reviews is the side story, in which one of their old friends from before they started teleporting everywhere has been on a quest to find Ryan’s former leader, a near-mythical figure called the Trader. His rules for survival and profit in the Deathlands have informed their every decision, and the mercenary aspect of these rules is why so many of their adventures that ended in cleaning up messes created by all the power-hungry and murder-addicted regional barons have ended that way by accident, after they tried to stay out of it instead. The A-Team, they ain’t. 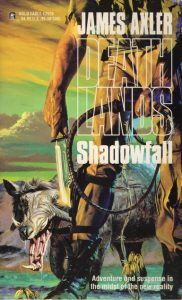 This entry was posted in Words and tagged Deathlands, men's adventure, science fiction on June 3, 2017 by Chris. 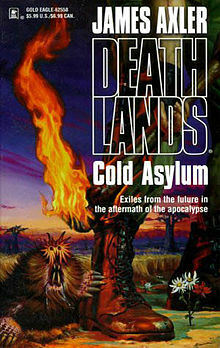 On Saturday I read Cold Asylum, which quickly dispenses with a set-up for several new locations and then with its title scene (a refrigerated, multi-warehouse-sized morgue inhabited by cannibalistic mutants), to proceed quickly into a Most Dangerous Game pastiche in which the newest member of the band of adventurers (a young, sheltered cultist kung fu monk pulled forward through time from right before the nuclear war) starts to show cracks in his loyalties and capabilities. How will they get out of this one?! I know it’s easy to see that I’m reading one of these books, roll your eyes, and move on, maybe wondering why I bother. This, right here, is why I bother. It’s just such a perfectly macabre sample of post-apocalyptica. And I know, it’s silly to imagine the refrigerators working a hundred years on, but that’s one of the premises you just have to accept. The nuclear generators are buried well, and they keep running without service. Otherwise, the whole series falls apart, because how would the teleporters work without power? Also, the part where the teleporters just never send you to an unpowered or otherwise destroyed location was a piece of genius in its own right. Also, all the time travel. Seriously, 125 book sci-fi series that is simultaneously post-apocalyptic and has good gender equity throughout? Except for the obligatory gun fetishism, what’s not to like? If you are paying a lot more attention than I would expect anyone to be paying, you would expect this review to cover the second Robin Hobb book. However, I ran into a pair of related problems. Maybe a trio of interrelated problems? You decide! See, thing one is that I’m still trying to read the series in conjunction with my wife. Thing two is that I went camping last weekend. The problem with that is that while I read a lot in the woods, she really does not. Thing three, which may or may not count as an actual thing, is that I didn’t want to deal with reading comics on my convertible laptop in the woods, because it’s quite a bit harder to handle / keep safe than a tablet in a case would have been. The relevance of this is that comics would have slowed me down quite a bit and made it at least mildly feasible that I could read the Farseer book without pulling irretrievably far ahead. So instead, I brought five Deathlands books. The theory being that I would be out for 5 days and read about a book a day. This math was largely correct, except that I was not there for the entirety of the bookend days, and also I was building / tearing down on those days. Enough inside baseball! You’re definitely here because you want to know how Deep Empire was. And I have good news: the title actually makes sense this time. See, they come out of the teleporter into the Keys, where they encounter pirates, undersea volcanoes (because, post-apocalypse), dolphins, and rogue marine biologists. All three did, which makes me wonder if I missed something in Shockscape. I probably didn’t, but the impostor syndrome is especially strong right now, since I noticed my reviews used to be a lot funnier than they are these days. Everyone not reading this because they left me behind long ago? I forgive you. This entry was posted in Words and tagged Deathlands, men's adventure, science fiction on June 1, 2017 by Chris.